Welcome to day 30 of 30 Days to a Food Revolution. We made it! This has been so exciting. Thank you to everyone who has written, commented and who is living this food revolution. We worked on getting Jamie Oliver as our last guest blogger, and we might have if I had not started talking with Anna. Anna was part of Jamie’s food team on the show and is very talented. Today’s guest blogger is Anna. Anna is a British Food Stylist and Writer living in Brooklyn. She writes the blogs Sweet by half and London Foodie in New York as well as contributing to the BBC Good Food blog . Her work has been published in Olive magazine, Woman and Home Magazine and BBC Good Food Magazine. Anna has worked freelance for Jamie Oliver over the past six years, which most recently included 4 months working on the TV show Jamie Oliver’s Food Revolution. The project touched her heart and she has continued to work with the people of Huntington since the cameras’ stopped rolling. Since returning to live America 3 ½ years ago I’ve witnessed a plethora of health trends take off in New York- lowering salt, a movement towards whole grains, heart healthy fats, eating less meat, eating grass-fed meat, eating local, organic, avoiding high fructose corn syrup….and that’s just to name a few. The one always seems to be avoided is the sugar issue. Working in Huntington was about more than making a TV show to me and the rest of the crew. It had to be. Jamie has an infectious passion and drive to help people and you can’t work with him without absorbing it. His energy though….well, that’s something I could only dream of having! We stepped into peoples’ lives in Huntington taught them how to cook from scratch. I had a girl in one of my classes at Huntington’s Kitchen tell me that she had never eaten fresh spaghetti before, only ever from a can. Hearing that sort of thing was a reality check for me- I realized how lucky I am that I was bought up knowing how to cook and what to put in my body. Going to the sweetie shop was a Saturday treat if we had earned our pocket money and we were occasionally allowed ½ glass of soda with mom’s made-from-scratch Sunday lunch. In Huntington we encouraged people to stop filling their bodies with E-numbers and preservatives and instead fill their tummies with real wholesome food, that cooking could be fun, quick and affordable. I should make a point to say that I’m not a Nutritionist. What I am is someone who has worked in food for six years and for the same number of years I’ve suffered from hypothyroidism. So, I’ve been forced to take an interest in what I’m willing to put into my body and I’ve had to make changes. My minor addiction to sugar has had to be tempered because a sluggish metabolism doesn’t do well living on empty calories. I knew sugar was a problem for a lot of people, I just didn’t realize how big the problem was and how little control we seem to have over it. Walking around the supermarkets in Huntington, I actually took notice for the first time as to what people were filling their carts with. It was pretty clear to me that there was a problem as big as people ignoring the produce aisle or filling their carts with processed meals. Sugar. Even when we pass on dessert or say that we don’t eat sweets, if we’re eating packaged foods, we’re still probably getting more than our recommended serving per day. Did you know that whilst the government has stringent guidelines for calories, fats, and sodium in school meals they don’t seem to give a toss about how much sugar is going into our children’s bodies? If they did, they surely wouldn’t allow 30% of a school meal to be made up with it. I could go into detail about how this goes back to our Government subsidizing corn whose surplus is turned into such things as high fructose corn syrup (HFCS) and how it goes into just about everything on the supermarket shelves because it’s cheap, but I won’t. You only have to watch movies like King Corn and Food Inc if you want to get into all the gritty political details. And I suspect many of you have. It seems that there a mass of on-going studies about the negative effects of high fructose corn syrup- weight gain, diabetes, lack of concentration, mood swings etc. but these can be linked to all varieties of sugar and sweeteners from the honey that we stir in our tea to the maple syrup on our pancakes. It doesn’t stop there and now that there has been public backlash against HFCS and even a Facebook movement. Companies’ are finding alternative ways and names to put sugar into what we eat. Because sugary things are tasty, because sugar is cheap and because tasty cheap things encourage us to consume more. Ever heard of Evaporated cane juice? If you read labels you will have seen it on the back of so-called health foods, in my opinion, the prime culprit of this labeling could well be Whole Foods. So what is Evaporated cane juice exactly? Sugar. Less refined and ironically more expensive than table sugar but sugar none the less. Will it make us fat if we eat too much? Yes. Could it rot our teeth? Most likely. Will it give our kids behavioral problems? I would wager yes. So, HFCS isn’t the only enemy at the table. We ought to cut back on sugar & sweeteners full stop. Which is hard to do if you buy food from the grocery store. It’s not just sodas, candy bars and flavored milk. If you buy salad dressing, chances are there’s sugar in it. And if you buy low-sugar products, diet sodas, or sugar-free yogurts to get your sweet fix then there are no doubt artificial sweeteners in most of them. What we need to do, is get over our sweet-tooth-addiction. Just like the commercials produced by the Corn Board claim: “everything’s fine in moderation” in reference to HFSC. Except that moderation is irrelevant when it’s the food companies deciding whether or not they ought to put sugar in our cereal and milk before we’ve even had a chance to dip a spoon in the sugar bowl ourselves. Of course it all leads back to clearing out the processed food from our kitchens. Consumer demand is our best bet in carrying forward the Food Revolution. A study led by the UK’s Guardian Newspaper recently showed that since Jamie’s overhaul of the school lunch program, grades have improved, truancy is down as are asthma attacks and illness. So it just goes to show, we really are what we eat. Start reading the labels and stop buying products that don’t need to contain sugar or sweeteners in them, jars of sauces, salad dressings, yogurts, milk frozen meals, bread, granola…. Don’t assume that because you bought it from a health food store that it’s good for you. Recent studies have shown that Agave nectar is just as bad for us as Corn Syrup and some claim even worse. If you have a sweet craving, make your sweet treats from home and start slowly cutting back on the sugar in your recipes You will be amazed at how quickly things begin to taste too sweet to you. Be wary of anything that says “low-sugar”. If it tastes sweet it has artificial sweeteners, which may be calorie-free but are best avoided. Start by giving up sugary drinks, which are the source of a huge number of unnecessary calories. Remember that although sugar is fat free, if you’re not exercising to burn it off then your body will convert and store it as fat. I feel honoured to have taken part in Huntington’s Food Revolution, The W.H.O.L.E Gangs 30 Days to a Food Revolution and beyond. Keep the energy alive! We still need signatures on Jamie’s Petition so please continue to spread the word! Don’t stop now; the Revolution is just getting started! • Heat the oven 350F/180C/Gas 4. Line the base of a Swiss roll tin with parchment paper and grease it. In a large bowl mix together all of the dry ingredients. • In a small saucepan gently heat together the coconut oil, molasses and agave until just warm. Mix together with the dry ingredients until fully coated. Press into your prepared tin. Place in the oven and turn the oven down to 325F/170C/Gas 3. Bake for 20-25 minutes or until the top looks lightly toasted and crispy. Cut into pieces right in the tin whilst still warm and then allow to fully cool before removing. For even more check out Sweet By Half today! Thanks for sharing! Due to a candida diet, I have had to cut out all sugars except stevia and yacon, and it has been challenging…there is even sugar in canned beans! I find that it has changed my taste buds, though, and I enjoy the flavors of veggies and other foods more than I did when I was eating sugar. 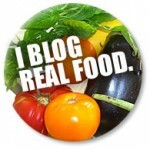 I have learned so much and found so many great recipes, info and blogs! This was SO much fun. 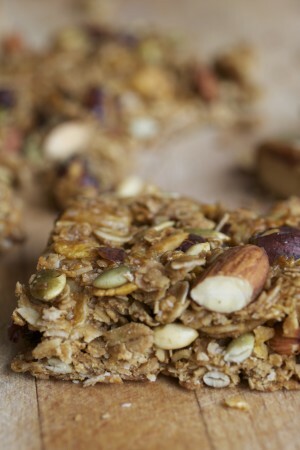 Anna – These granola bars look amazing! I love the idea of using cornflakes! I've been thinking about making a low-sugar jam this summer since my 4 year old LOVES his jam. I'll definitely be checking out your recipe. Thank you so much! This has been a great 30 days of posts! I have learned a lot and gotten a lot of great new recipes. This is a great post to end with! We have been trying to cut sugar and artificial sweeteners in our diets. The granola recipe sounds great. Can't wait to try it! This has been a wonderful event, Diane. Well done! I too will miss this series! It's been great! I love these granola bars – my kids (with the exception of the one that doesn't like nuts) would like them too. Maybe I could sneak some nut butter in there too without anyone noticing. Great post Anna! I so struggle with the sugar in the house due to my husband and two teenage sons. They get the HFCS thing but not that sugar as a whole should be reduced. And they don't understand why we're the only family in town who focuses on these issues. When I bake or prepare food I always use less sugar and they never notice so I'll just have to continue working on it I guess. Programs like Jamie's Food Revolution go a long way in bringing the crisis to mainstream attention. Rock on! The series was great, thanks to Diane! I'll miss the daily emails. Hoooraaaay! We did it. What a treat this as been to check in every day and find such great tips and recipes. It was an honor to be a part of this. Thank you Diane! And thank you Anna. Very good post! I have a sweet tooth that is hard to deny. But adding stevia to honey has been a great way to stretch the honey (Kelly at The Spunky Coconut taught me this). Will give your granola bars a try! It's "out-to-the-park" season and grab-and-go snacks are always handy. Thanks everyone! great last post! they were all great really. I can relate to this post my family of four were some of the biggest sugar tooths (teeth?) around. although most of it was homemade I went throught tons of sugar. since I've cut out most sugar I can tell you all of our tastebuds have changed. it's wonderful. we all feel better. one of my favorite things to do is grocery cart watching. it's a bit depressing. most kids these days don't know what whole food is. one of my sons friends asked him the other day what was in his peach. it was the pit. my son also had to explain hummus and beets to him. Thanks Diane… you did a great job with this and I have really enjoyed the recipes! Yum! Those look delicious. I already cut back on sugar. We do most of our own baking and always use less sugar than the recipe says. what a great 30 days of wonderful info!! Thank you so much to everyone who took part in this amazing event. Thanks Anna for the great tips about sugar. My new quest the past week has been to get rid of sugar, great timing. The granola bars look yummy. Something my family has missed are granola bars, so I will have to test these out! This has been an amazing series, thanks so much for all the wonderful information! This post is a wonderful way to end it (although I'm sad to see it go). These bars look delicious! Thanks again everyone that put this together. Such a great post, Anna. The granola bars look amazing! Your photo with handsome Jamie Oliver is so cute! Thanks so much, Anna! Sugar is a big problem for sure. Once we give it up, we don't miss it … but getting there can sometimes be difficult. Your granola bars look tasty. I don't use any processed cereals, but I'm sure I could adapt it to my needs. 🙂 How awesome that you worked with Jamie on the Food Revolution and have worked with him before and will again. Keep up the great work! Oh, and yes, many of us with gluten issues also have hypothyroidism. Do check out the connection. Fabulous job hosting, Diane! It's been a truly incredible event. I'm really sorry to see it end. 🙁 Now to put into practice all that I've learned! What a great 30 days, Diane. You gathered together some of the best ideas, information, and people living and striving for a food revolution. I loved this post. How fun. Great last post! I, too, am trying to reduce my intake of sweetened foods, even those I make myself. I've been experimenting with coconut sugar and stevia with great success, and this experimentation came after a great reluctance to do so. We've been so deluded into thinking that white sugar is the only way to go AND that we must have sweetened foods to satisfy our sweet tooth. I'm learning to eat and be satisfied with naturally sweet organic strawberries and loving it! Great post! Sugar is pretty scary and I'm still working on my own addiction to sweet things. I may not use refined or processed sugar in my food, but I still have other sweeteners I need to use less of. There’s nothing like being lean and healthy. In today’s America, we have toworkout more often and throw off our unhealthy diet habits. It’s not difficult. You only need to stick to a diet program and keep going until you reach your goals.